Sometime in the coming year, near-field communication (NFC) technology will give early adopters the power to pay for stuff simply by holding their phone up to a retail checkstand. Of course, as Anne McDonald reported earlier this month in "Can a Phone Become Your Digital Wallet?" that convenience will be a long time coming for most users, even if they rush out and buy one of the first NFC-capable phones to arrive. But take heart: We've rounded up half a dozen cool mobile apps that will let you pay for stuff (and receive payments for stuff) with your phone right now, plus one promising NFC alternative that will be available very soon for any smartphone platform. Of course, most of these payment apps are designed strictly for person-to-person transactions, but a few will let you make purchases at the retail counter. Owe someone money? (Or better yet, do they owe you?) Transferring cash between two people is easy, and plenty of apps can help you perform the task. 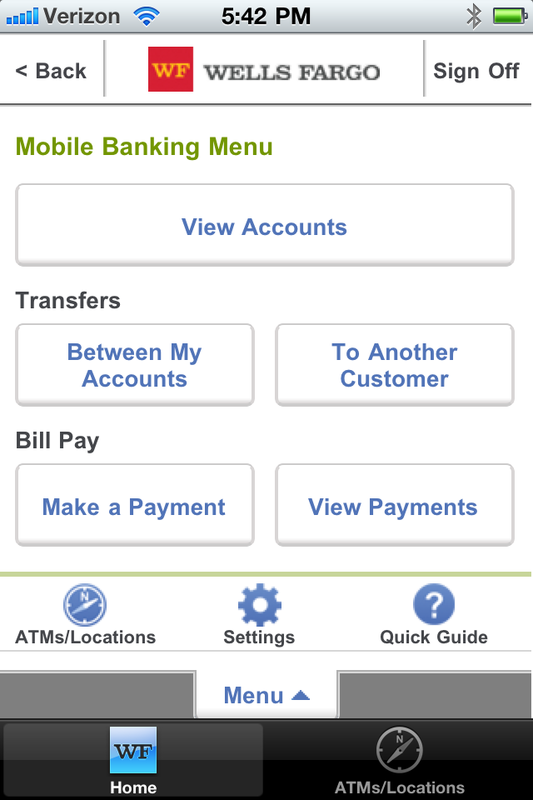 In fact, if you do any online banking from your phone, you may already have the app you need. It's worth noting, though, that this arrangement is the least convenient payment method covered in this roundup, as it has the most limitations on who can pay whom and requires the greatest exposure of private account information. Wells Fargo is among the major banks to create Android and iPhone apps for their mobile customers. Large banks such as Bank of America, Citibank, and Wells Fargo have flocked to the Android Market and the iPhone App Store to put their services in the hands of mobile customers. And while people typically use these apps for little more than checking balances on the run, most of the major banking apps have enough banking power to let you pay (or get paid by) anyone who has an account at the same bank. The caveat here is that transferring money between customers requires the payee to share account numbers with the payer. So unless you know each other extremely well, this is not an ideal way to handle your transactions. Then again, if the payee is a company or individual with whom you do business frequently, you can probably log on to your account from your PC and add the recipient to a list of approved payees. Thereafter, you can log on from your phone any time to send a payment when you need to, either via instant electronic payment or via check. Best of all, this method lets you pay folks regardless of whether they're customers at your bank. The ING Direct app makes money transfers between people registered at ING a snap. Of all the major banks in the app stores, ING Direct seems to have the edge in person-to-person payments. The app actually includes a person-to-person payment option. And though you do have to register the person through ING Direct's browser interface (to prevent unknown or unauthorized people from adding themselves via a lost or stolen phone and draining your account balance), it's very easy to send payments to friends once you've registered them in ING's system. Besides having the best-established name in online payments, PayPal offers the most-advanced options for person-to-person smartphone payments. Any two people with PayPal accounts can send personal payments between themselves with no transaction fees, as long as the payments are made from a linked checking account (as opposed to a credit card). PayPal Mobile runs on Android, BlackBerry, and iPhone, though the app's features differ depending on the version. Most notably, the iPhone version of PayPal permits users to cash checks by taking a picture of them with the phone's camera, while the other versions don't yet support this feature. 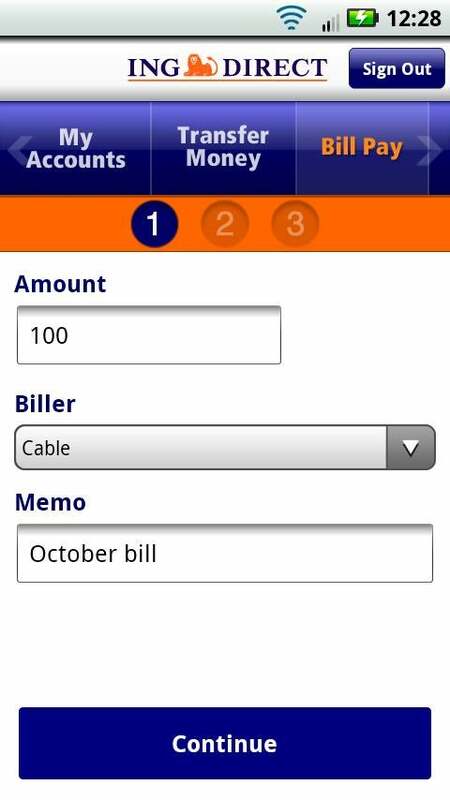 The iPhone and Android versions let you use Bump to exchange contact information, and they include an option to split a dinner bill easily, while the BlackBerry version has yet to catch up on either score. A new app called Venmo offers PayPal-esque features for paying friends, splitting restaurant checks, paying your utilities, and so on. Available for iPhone and Android, Venmo is currently in limited release, so you'll have to sign up on the app's waiting list in order to give it a try. It lets friends send and receive payments with no transaction fees or signup charges. It also has one odd additional feature: You can link your Twitter and Facebook accounts to let everyone on your friends list know the identity of the lucky recipient of your largesse. It's not entirely clear why that's a good idea; but in the post-privacy era, we guess that some people must consider it eminently sharable information. To deal with shared expenses between friends, a little app called PayBack for iPhone lets you track who spent how much for what. This comes in handy for things like tracking group expenses during a trip or reconciling monthly expenses between roommates. When you're ready, you can quickly set up a report that tabulates who owes whom how much, and then send the report via e-mail. Essentially, it amounts to an IOU (or a "UOMe"?). Collecting on the debt, however, will require another app. Making retail purchases with your smartphone is still a mostly elusive dream, but a couple of apps can give you a glimpse of the future today. And in a few months' time, a new service called MobilePayUSA will make real-deal retail purchases possible from most smartphones without the need for NFC technology. 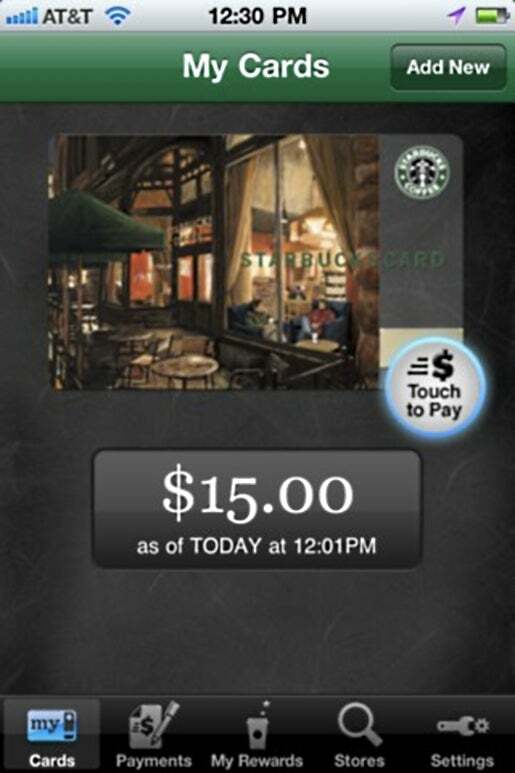 Starbucks Card Mobile for iPhone keeps a running tally of your remaining gift-card balance at Starbucks. If someone gave you a Starbucks gift card for Christmas, but you keep forgetting to put it in your wallet, the free Starbucks Card Mobile iPhone app is a must-have. To use the app, you'll need to register your gift card at Starbucks.com. Once you've done that, simply enter the card number into the app, and authorize it with your username and password from Starbucks.com; at that point, a picture of your card will appear in the app along with your current balance. You can enter as many cards as you like. Once you get to the counter at your local Starbucks, launch the app, tap the glowing Touch to Pay button to reveal your unique barcode, and then hold the phone up to the scanner at the cash register until you hear a beep. When you're done, the app will display your new balance. No word yet on when this app may come to Android, but we're crossing our fingers that it will happen soon. 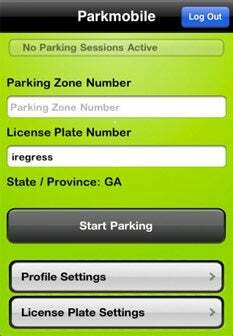 The Parkmobile app lets you use your phone to feed the meter at your parking spot, and even warns you when there are 15 minutes left on the meter. The big hold-up with near-field communications is likely to be retail adoption, because the technology requires businesses to invest in new point-of-sale hardware that can read the NFC chip in your phone. Meanwhile, a company called MobilePayUSA is readying its service for non-NFC phones. Though there's no way to predict how widely the soon-to-launch MobilePayUSA service will catch on once it goes live, the barrier to entry is low enough that most small businesses may get on board quickly. Basically, all a business owner needs to do is register with the company's Website and enter a couple of codes from the business's POS system to authenticate the account. When customers walk into a MobilePay-enabled business, they can tell the cashier they're paying with MobilePay, launch the app, enter a payment amount, and hit Pay Now. From there, the app will use geolocation to line up the transaction. In the big picture, we're waiting impatiently for NFC payments to go mainstream. But with these apps, we can enjoy some of the benefits of NFC without the wait.